Video of Anne Arundel County Council candidate Michael Peroutka’s press conference yesterday is now available. The entire conference follows the excerpt I want to present first. In the presser, Peroutka was asked if his endorsement of Southern secession and singing of Dixie as the national anthem was a mistake. He responded by saying that I altered the video to suit my political objectives. Au contraire, Mr. Peroutka, you do not speak truly. Peroutka asserted that Professor Warren Throckmorton had “altered” the revealing 2012 video of his controversial comments and “Dixie” chorus at the League convention before posting it online. In fact, Throckmorton had reposted the entire, unaltered, 51-minute video on the conservative Evangelical Christian blog Patheos. The video was shot by Michael Cushman, a former member of the National Alliance, a neo-Nazi group, who now leads the League’s South Carolina chapter. Cushman had posted it at RedShirtArmy, a League-affiliated YouTube channel. Cushman, in an irate comment posted under Throckmorton’s piece, demonstrates that the video is authentic, because he insists that he made it, and he demands credit. He complains that “neither this hit-piece nor the Leftist bloggers who are linking to it give me any credit for shooting this video.” He adds, “Nor did they ask my permission to post it on their websites.” The unedited video on Patheos is identical to the one on RedShirtArmy. Several outlets, including RightWing Watch, Raw Story, and Gawker, have posted clips of the video, crediting Throckmorton with the find. Peroutka didn’t help himself with this performance. He refused to back away from the League of the South, he defended secession, and said calling Dixie the national anthem was just fine. If anything, he simply validated my reporting and that of others. Steve Deace is a right wing, religiously conservative radio show host in Iowa. He appears to have a sizable tea party following and weekly gives League of the South member and Anne Arundel County Council candidate Michael Peroutka a platform on his broadcast. Yesterday on his Facebook page, he discussed recent controversies surrounding Mark Driscoll, but ranted more about Rachel Held Evans (calling her “Rob Bell in drag”) and me than he did about Driscoll. He seems upset that Evans and I have been bringing facts to the public while people he likes more are being silent. If Driscoll’s sins are so great, then surely we can find those within Christendom who actually have solid theological credentials as the means by which to hold him accountable for them. But I consistently see two names quoted regarding Driscoll’s misdeeds and malfeasance. And these are people that shouldn’t be taken seriously as a source on anything regarding the integrity of the faith until they publicly repent themselves. One of them is Warren Throckmorton. Throckmorton is a moral heretic. A proponent of homosexuality. He also once claimed Michael Anthony Peroutka, a man I have known for years who has even been a guest in my home, is a racist all because he actually believes what the Founders believed. The other is a flat-out heretic/pretend evangelical named Rachel Held Evans. She’s basically Rob Bell in drag. Many of the devil’s accusations against us are true, but that doesn’t make him a source worth citing. Deace appears to be worried that those who get accurate information from me on Mars Hill Church might read other things I write and then be persuaded to believe ideas he opposes. I don’t know Mr. Deace but he seems to have a low view of his audience. I suppose it is possible that some Mars Hill readers will consider other materials on my blog and in my other writings. In fact, I hope they do. However, I hope they will consider them with the same critical thinking skills they use with the material on Driscoll. Deace seems to be afraid that our ideas (whatever he thinks they are) will be so compelling that they will be swept away into heresy via the truth presented about Mars Hill. It is a lame argument as many of the commenters on his post declare. To a lesser degree, Deace exhibits this negative side-effect. He repeatedly labels Held and me as “heretics” and calls Evans “Rob Bell in drag.” He calls into question the facts we present because we are not part of the ingroup as he has drawn the boundaries. As a matter of intellectual hygiene, I think it is desirable to become aware of and avoid ingroup bias. Such bias can lead to an avoidance of truth (as in this case) and harmful stereotyping. I can’t speak for Evans, but in my case, his biases have led him to call me a heretic for two basic reasons: he says I am a proponent of homosexuality and he says I oppose Michael Peroutka. That’s it. For Deace, I am not credible for these reasons. Let’s examine them. I don’t know what he means by “proponent of homosexuality.” Indeed, I am a proponent of equal treatment under the law for every citizen. I oppose stereotyping and prejudice against GLBT people. I believe Christians should be honest about research relating to sexual orientation. For instance, it is clear that sexual reorientation therapy doesn’t work and should be avoided. However, I also support the right of anyone to abstain from any sexual activity if their religion forbids it. Deace uses the phrase “proponent of homosexuality” as if one can create more of it by being in favor of it. This, of course, is inconsistent with any research on the subject and as a Christian I feel it is my duty to tell the truth about that. However, I learned years ago that being an ingroup member meant shading the truth or lying about it in order to preserve the prevailing beliefs of ingroup leaders. On Peroutka, Deace says I oppose Peroutka because Peroutka believes what the founders believed. That is a bizarre and selective reading of my writing about Peroutka, the Institute on the Constitution and the League of the South. In fact, Peroutka believes some of what the founders believed but he distorts the founders to make them into Christian reconstructionists. I have pointed out that Institute on the Constitution founder and Anne Arundel County Council candidate Michael Peroutka was once a board member of the League of the South, has been a frequent speaker at their conferences, pledged his resources to the League, and refused to distance himself from the League in response to criticism from current Republican leaders in MD. I have pointed out that the League of the South is working to generate support for Southern secession, and wants to establish a white homeland in the South apart from the rest of the nation. League president Michael Hill denigrates Martin Luther King, Jr., and Abraham Lincoln, while lauding Nathan Bedford Forrest (first grand wizard of the KKK). On Peroutka’s Institute on the Constitution website, articles justify slavery and racial discrimination. Peroutka thinks the South was fighting for freedom and the right cause. He laments the fact that the South lost at Gettysburg. To the League of the South conference in 2012, he favored secession and led them in singing “I Wish I Was in Dixie” as their national anthem. Peroutka says he is not a racist, but then he says he doesn’t know racists in the League of the South. The League of the South wants a white Southern homeland. What should we call that? It is beyond me how Steve Deace can embrace Michael Peroutka and call me a heretic. I do not understand that way of thinking. However, if Steve Deace said the sky is blue or that Jesus rose from the dead, I would believe him. On the other hand, I won’t believe him when he tells me that Michael Peroutka is promoting an honorable cause. I don’t reject Deace’s views about Peroutka and the League because Deace is not in my ingroup, but rather because I have evaluated the evidence with my own mind. And that is what Deace should do about Mark Driscoll, and Rachel Held Evans, and me. If he did, he might find truth in surprising places. *Myers, D. (2010). Social psychology, (10th Ed.). New York:McGraw-Hill. Click here for all Mars Hill Church posts. This morning former League of the South board member and candidate for Anne Arundel County Council Michael Peroutka held his news conference in Maryland. I was unable to go but I talked to one person in the meeting and am seeing some news reports filed after the event. According to a source at the event, Peroutka accused me of unfairly editing the video of his 2012 speech at the League of the South annual conference. In that video, he supported secession and led the crowd in “Dixie”, calling it the “national anthem.” That post is here and as you will see, I included the entire video uncut, along with a separate video of his tribute to Dixie. In other words, if my source is accurate and Peroutka accused me of editing the video, Peroutka was wrong. According to my source and the Capital Gazette, Peroutka called the League of the South “a Christian, free-market group.” According to this report, he sees no racism in the League of the South. The League of the South is pretty clear that they want a Southern homeland for white Europeans. Peroutka’s designation for the League is not one that the League uses. They claim to be a Southern Nationalist organization that seeks secession and you don’t have to be a Christian to be in the League. If his approach to the League is any indication, I doubt Peroutka helped himself with this press conference. Meanwhile, a local caucus of African-American leaders has invited Peroutka to speak to their organization. Annapolis, Maryland- July 30, 2014– Carl O. Snowden, convener of the Caucus of African American Leaders have invited Michael Anthony Peroutka, the Republican candidate for Anne Arundel County District Five to address the Caucus of African American Leaders at its September meeting. Mr. Peroutka who is holding a 10:30 a.m. press conference today at Hampton Inn in Glen Burnie, Maryland to respond to allegations that he is affiliated with a hate group and that he is an extremist. He is expected to respond to both the Caucus and other Republican candidates that have indicated that they will not support his candidacy. Mr. Snowden applauded District 30 Republican State Senate candidate Don Quinn, who has publicly disavowed the candidacy of Mr. Peroutka. The Caucus of African American Leaders is a consortium of black elected officials, clergy, and civil rights organizations in Anne Arundel County, which includes the NAACP, Black Chamber of Commerce, sororities and activists. The Caucus has invited both Republicans and Democrats to address them in the past. Previous candidates who have spoken before the Caucus include County Executive Laura Neuman, Speaker Michael E. Busch, Delegate Steve Schuh, former Anne Arundel County Sheriff George F. Johnson and Mr. Quinn to name a few. “We believe that Don Quinn and the Republican candidate for Governor Larry Hogan is correct in their assertion that the extremist right-wing views of Mr. Peroutka should not be represented on the Anne Arundel County Council and we have called on Annapolis Mayor Mike Pantelides to join his fellow Republicans in denouncing his candidacy”, said Mr. Snowden. He further stated, “Because we anticipate that Mr. Peroutka will deny that he is an extremist with racial animus, we are extending this public invitation for him to join us at our September meeting at the Wiley H. Bates Legacy Center in Annapolis, Maryland to speak directly to African American leaders’, said Mr. Snowden. Mr. Snowden who knows Peroutka spokesman John Lofton, the two served together as panelist on WJZ-TV’s Square Off program, said, “All one has to do is review the public statements of John Lofton and Michael Anthony Peroutka and if their views are not extremist, than water is not wet”. For more information, please call 410-269-1524. Paul Tripp has resigned from the Mars Hill Church Board of Advisors and Accountability. No reason was given for the departure. Paul Tripp was appointed to the Board in November, 2013. I will add more information as it becomes available. Innovate4Jesus appears to have a cozy relationship with Mars Hill Church. Mark Driscoll has several videos embedded on the site and there is a Mars Hill channel. While this probably won’t last long, Driscoll’s bio on the site also touts the NYT Bestseller status of Real Marriage. Michael Anthony Peroutka, the Republican candidate for Anne Arundel County District 5 will be giving a press conference on Wednesday, July 30th to address the recent controversy about allegations made against him by Carl Snowden [as organizer of the Caucus of African-American Leaders]. There will be a question and answer session after a short statement is made. Press conference will start at 10:30am. Doors open at 10:00am. Carl Snowden’s charges can be found in this Baltimore Sun article. Mark Driscoll in 2000: "We Live in a Completely Pussified Nation"
I have been writing about Mars Hill Church since late November 2013. In the process, I have met many people who once attended Mars and some who still do (over 100 I think). In these conversations, especially with ex-members who were around from the early days, similar stories come up. One familiar story I have not written about is Mark Driscoll’s proclamation that we “live in a completely pussified nation.” Apparently this material was deleted from the Mars Hill website and is not now available anywhere. According to my sources, some Mars Hill pastors have asked former members to destroy any copies of the thread they had printed out. 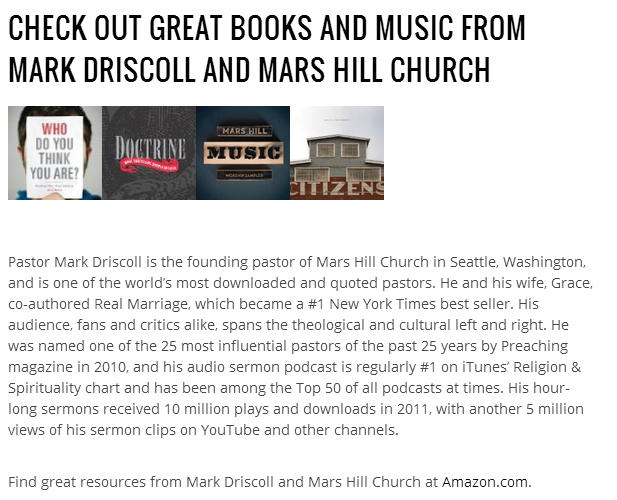 It has now become available again and I think it may be of some benefit to understand the historical development of Mars Hill Church and the controversies surrounding Mark Driscoll’s preaching and commentary on gender. 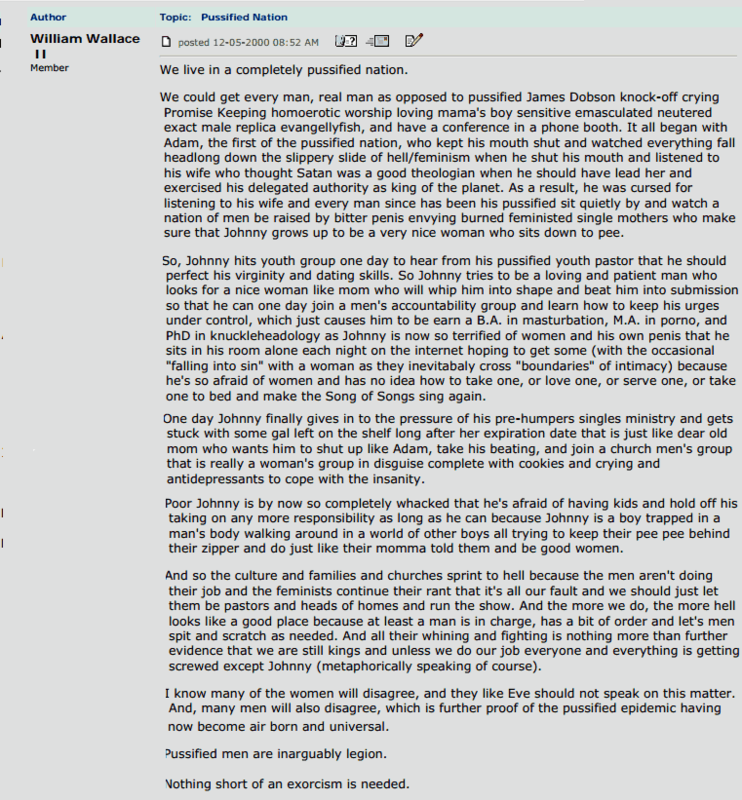 In 2006, Driscoll commented favorably on his William Wallace II remarks in his book Confessions of a Reformission Rev (see below). To my knowledge, he has not refuted or distanced himself from these sentiments since then. I do offer the observation that the thread is 14 years old and may not represent how he would communicate to his church today. The image below is of the first paragraph of what turned out to be a thread of over 100 pages of material on the Mars Hill Church unmoderated forum called Midrash. To read some history behind Midrash and this thread go to Wenatchee the Hatchet’s site. So because Driscoll believed the men in his church were soft and feminine, he attacked them anonymously. His opening salvo as William Wallace II, while clever in its machismo, was quickly challenged by another person who wondered if Jesus was pussified. Driscoll, as you will see if you read the whole thing, dismissed the poster’s concerns. In the excerpts below, Driscoll belittled those who disagreed with him. To read the entire 100+ page thread, go here. This is a book about Mother, the great American “Mom,” and what she is doing to the young men of America. In its pages a world-famous psychiatrist describes in unforgettable terms a new American tragedy – the millions of young men in this country today who live in confusion and emotional chaos, condemned by millions of well-meaning and unthinking “Moms” who will not cut the apron strings between them and their sons. 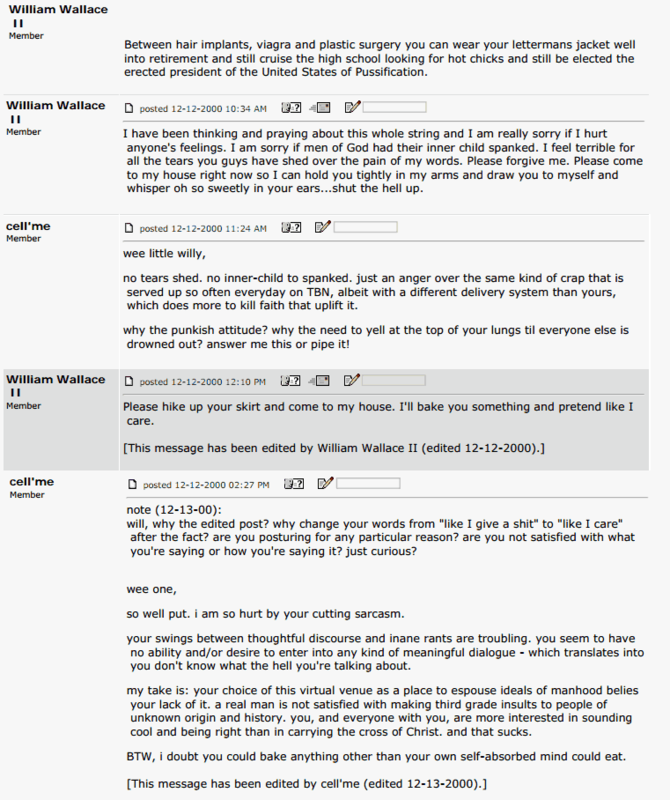 Author Warren ThrockmortonPosted on July 29, 2014 Categories Mars Hill ChurchTags Mark Driscoll, Mars Hill Church, Pussified nationLeave a comment on Mark Driscoll in 2000: "We Live in a Completely Pussified Nation"
On the Innovate4Jesus website, “#1 New York Time Bestseller” links to the January 22, 2012 NYT list for “Hard Cover Advice” books on which the Driscolls’ book Real Marriage placed at #1 for one week. See below for the text copied as it is now on the I4J website. With over thirteen years of experience, Justin has been recognized as an innovative, entrepreneurial, results-focused leader in the marketing, advertising and public relations industry. He has held senior management roles for some of the most revolutionary start-ups, as well as larger organizations such as Cox Enterprises, Home Depot Supply, and Autotrader.com. Marketing projects led by Justin include several best-selling books including a #1 New York Times Bestseller, award winning advertising campaigns, and web tools used by millions of users every day. Justin currently leads the communications and social media teams for one of the largest, fastest-growing, and most innovative churches in the country. He enjoys technology, design and connecting people to new things. You can find him in Seattle, WA where he lives with his wife and three kids. 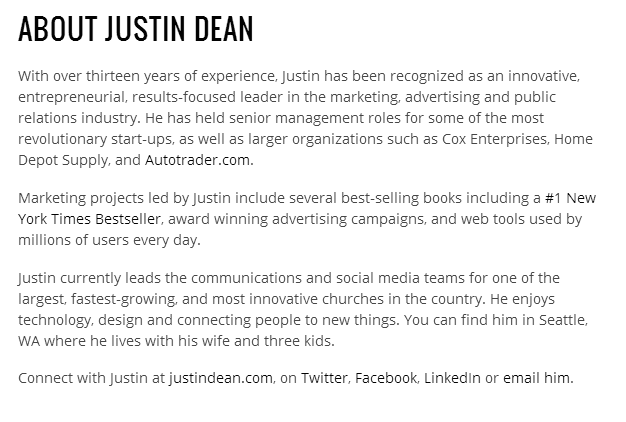 Connect with Justin at justindean.com, on Twitter, Facebook, LinkedIn or email him. In a tweet earlier this afternoon, Becky Garrison asked Mr. Dean to elaborate on his role in the marketing campaign. I am also curious about how Mars Hill staff (was it just Mr. Dean or were others involved?) were included in the marketing campaign. The relevance here is that paid church staff were apparently involved in promoting the Real Marriage campaign. As has been widely reported (e.g., here and here), Mars Hill Church contracted with Result Source to purchase books valued at over $200,000. In the contract with Mars Hill Church, Result Source guaranteed that their method of gaming the New York Times Bestseller list would result in Real Marriage hitting #1 on the Bestseller list or else the additional $25,000 fee would be refunded. Dean’s bio raises questions about who actually implemented the campaign. Dean seems to imply in his bio that he was in charge. I am also curious about how much time paid Mars Hill staff put into assisting Result Source or in other ways helped get Driscolls’ book to the status guaranteed by the contract. If staff assisted in gathering names and addresses for use by Result Source, or assisted in other functions related to the campaign, then it is likely that the real cost of the Real Marriage campaign greatly exceeded the $210,000-250,000 figures frequently reported and which are based simply on the Result Source contract. Dean may have been involved in other ways such as developing ads or promotional material and those materials may have been very good. However, since it is now known that the Result Source campaign guaranteed #1 status, taking credit for the result seems to be a hollow accomplishment to tout. After the many mixed signals Mars Hill Church has sent about the Result Source-Real Marriage campaign, it is surprising that anyone associated with Mars Hill Church leadership would extol it. Baltimore City Paper on Michael Peroutka: "Extremist Dressed Up for Mainstream Appeal"
Out today, the Baltimore City Paper has a well-written summary of Michael Peroutka’s rise to notoriety. Writer Van Smith notes that Peroutka is well positioned to win the Anne Arundel Council seat because he is similar to the mostly white, well-educated and well-to-do population in the 5th District of the county. From there Smith outlines his claim that Peroutka is an extremist trying to look mainstream. I’ve saying that for over a year; Smith does a good job of documenting the claim. Similarly, the name of Peroutka’s Institute on the Constitution (IOC) fails to communicate its actual mission: creating theocratic governance based on both testaments of the Bible, similar to how extremist Muslims would like to establish states based on sharia law derived from the Quran. In all, the article is a good introduction to why Michael Peroutka’s IOTC should not be trusted by churches (or anyone) and why I hope he does not win the county election. Author Warren ThrockmortonPosted on July 28, 2014 Categories Institute on the Constitution, League of the SouthTags Anne Arundel, Institute on the Constitution, League of the South, Michael Peroutka, Van SmithLeave a comment on Baltimore City Paper on Michael Peroutka: "Extremist Dressed Up for Mainstream Appeal"